Last night I was hanging out with my family when I heard the news about Tyler Trent. To anyone who has followed the story you knew this day was coming. I just wanted one more amazing upset from Tyler. Not on the sports field, but in his life. I wanted the fairly tale ending. The amazing thing about Tyler though is that he knew that fairy tale ending was not going to come, and he still kept battling. This 20 year old young man was tougher and more together than he should have been at his age. In the midst of battling this rare disease he could have spent his time enjoying the things that a normal 20 year old would have. Instead of doing that Tyler went out and changed Purdue forever. I have worn his #TylerStrong band since the day I got it. Before the Iowa football game I was given another one, and that one has sat alongside it on my arm ever since. I only was lucky enough to meet Tyler a few times. They were always brief encounters. I was doing a job and Tyler happened to be there. I always wanted to let him know though that we were in his corner. In my profession I photograph athletes who go on to pro careers and have millions of people buying their jerseys. The person that I am most proud of my job bringing me into contact with was Tyler. From the moment I read the Mike Carmin article on Tyler I was hooked. This was a young man who had it together despite the odds not being in his favor. Over the course of the last year and a half or so Tyler had a few setbacks. At any time he could have quit. Thinking back to myself at twenty I could see how easy that would be. Not Tyler. For every one of those setbacks he pushed forward and seemed to gain strength from it. It made him see why his mission was so important. I don’t think the #TylerStrong campaign was ever about Tyler. He knew that. It was about making sure that we beat this thing so that others don’t have to go through what he had to go through. That is what makes his story so amazing. In the face of death many would fold. He decided to make a difference. What a difference he would make. Scrolling through Twitter I saw the references to Tyler as the Purdue super fan. That is definitely true. In a way I think it is backwards though. 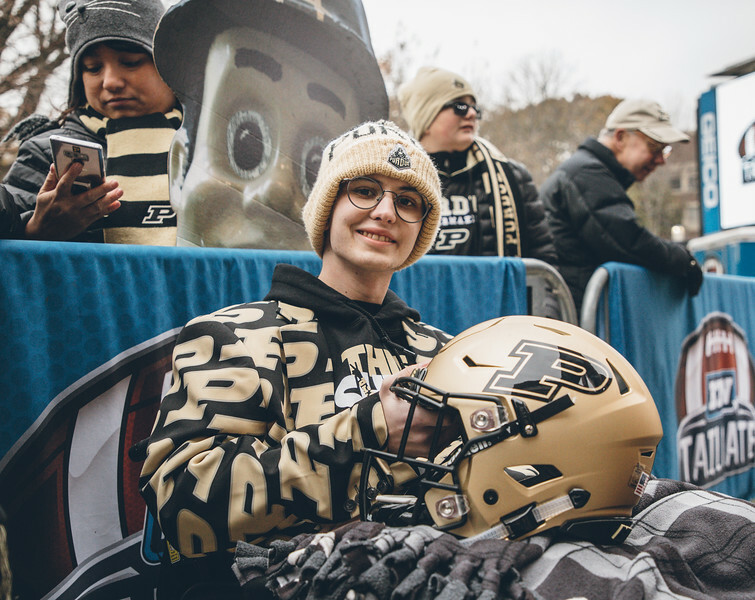 The Purdue community seemed to all be super fans of Tyler. That is what made him so special. He gained a following, and he used that following to spread awareness for cancer research. I started donating because of Tyler. Many others did too. He was a brief shining star in most of our lives, but his light will remain for a long time to come. As the header above says this was not a post that I wanted to write. Obviously I never wanted this day to come. I also don’t know that it is my place to write about Tyler. As I was finishing up a little work around the house I started thinking about it though. This post was never meant for anyone else. This was always meant for me. We all grieve differently. My way was to write about this young man that touched me so much. This sounds weird to say, but this is not the end for Tyler Trent. Obviously he is no longer with us physically. What made him so amazing though is what he left behind. He started a movement at Purdue. Those of us not touched by cancer are not always aware of exactly what it can do. He has made us all aware. His efforts I believe will go a long way to helping fight this horrible disease. I have read things saying that Purdue should erect a statue for Tyler. I am torn on that idea. I would have guessed that he would want that money to go to research. That was my first thought. Then I realized that the statue would be a reminder of what he did in a short time at Purdue. It would be a monument for what you can do if you put your mind to it. He was more active with a body that was failing him than most college students are for their entire term. In the coming months I am sure how to honor him will be discussed. I think the best way that we can honor him is to continue his fight. Here are a few ways that you can do just that. He was quite a young man, wasn’t he? Thanks for sharing your story about him.